Rural northern MI nees Volunteer drivers to help cancer patients get to and from treatment. The best treatment in the world is no good if a patient can not access the care they need. Volunteers donate their time and the use of their personal vehicle to give cancer patients in their community a much needed ride. 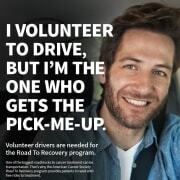 This is an excellent volunteer opportunity that gives the volunteer control over how frequently they drive, the distance, and even the days of the week. Many patients tell us how their driver became their friend as they supported them on this personal journey. Help patients in your own community get back and forth to treatment. Volunteer choice of hours to serve. Volunteers choose days, times, and distance. Reliable vehicle, computer access, & compassion to help cancer patients.